The original Winston is already a favorite among desktop riser users. Add a swift electric lift mechanism, innovative ergonomics, and a polished aesthetic to boot, and the “Winston-E” lands itself comfortably in territory no riser has been before: the executive suite. Polished, refined aesthetic. Electric lift mechanism with programmable positioning for sitting and standing. 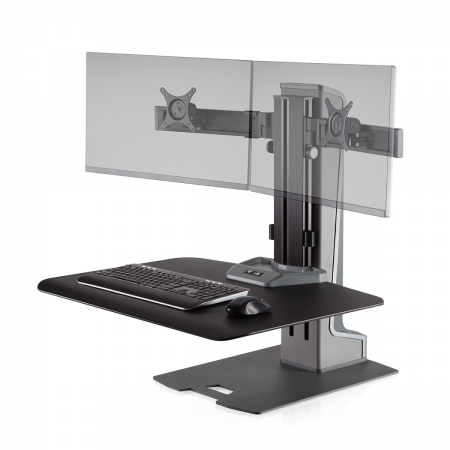 Innovative monitor focal depth adjustment for superior ergonomics and screen-sharing. Stable work surface for typing. It has a price tag to match its state-of-the-art capabilities. For the executive with a budget for office décor, the Winston-E offers an unparalleled combination of style, ergonomics, and stability. It's a "Made in America" product with a classy design. 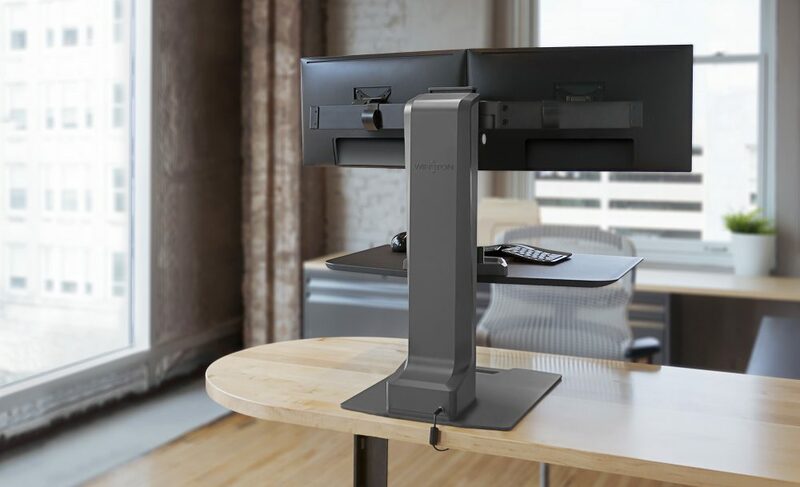 And it's the first free-standing desktop riser we’ve seen to boast monitor focal depth adjustment—a concept patented by the manufacturer—which gives you another dimension for positioning your monitor(s) ergonomically. Highly recommended for those who make it a policy not to settle for second-best. Our review staff quarters have been buzzing with talk about the Winston-E ever since we caught a glimpse of its polished design at a trade show in 2015. The tester unit arrived last week, and we wasted no time getting the unit out of the box, assembled, and installed on one of our desks. Before we took a look at the Winston-E, we were aware that Innovative (the manufacturer of the Winston-E) is a company reputed for high its quality, American-made products; its previous edition of the desktop riser, called the Winston, is a standout riser of its own that we reviewed favorably in the past. 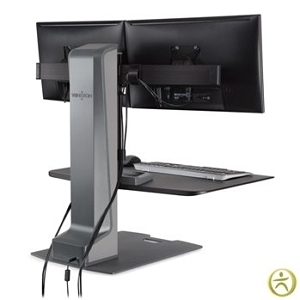 We expected the Winston-E to maintain this same standard for excellence, to carry forward the strengths of the original while adding new features to the mix, ergonomic or otherwise, to help position it in a rapidly developing desktop riser market. ('Innovative' is the name of the company, after all!) What struck us was that on paper, and through elegant marketing (like the video below), all these requirements seemed met. But this isn’t our first rodeo, and we’ve been around the block long enough to know it takes a behind-the-scenes test to determine the mettle a product is made of. All to say, we were eager to get our hands on Innovative’s heir to the Winston. The sheer quantity of components that go into this device was the first thing that impressed us. Our instinct was that it would be a chore to assemble, but in this respect we were pleasantly surprised. It took two of us about 30 minutes to assemble the Winston-E from start to finish, and that’s given the fact we were also filming the process for our installation video (coming soon). You’ll likely be able to get your Winston-E up and running even quicker, in as little as 20 minutes according to the manufacturer. A quick piece of advice: be careful rotating the unit on your desk when you’re installing the base mount to the monitor post. The instructions call for you to let half the base linger over the side of the desk so you can get at the underside of the base for attaching the screws. As far as we could tell, there’s no way around this. But you may want a helper stabilizing the unit, or some other object to keep it steady while you work underneath, just for extra precaution. Winston-E's electric height adjustment buttons. The memory presets for the electric height adjustment took us a few tries to nail down, but it’s a fairly simple process. Press the up or down arrow in the direction you want to go, press again to stop, and then wait a few seconds (be patient! ), and press down on both arrows at the same time to lock in at a height. You can see visual instructions here if you're curious. We have to credit the Winston-E with one of the easiest sit-stand adjustments we’ve ever seen. Only quibble is that the motion does make a little noise (not enough to disrupt any of your coworkers). As the Winston-E sat fully assembled on our desk, we were stunned by its clean, professional aesthetic, which we have to say matches its elegant portrayal in Innovative’s marketing materials. It outshines rival electric risers like the Electric Kangaroo and the One-Touch Ultra, and even gives the QuickStand (not electric, but the previous market leader in terms of design) a run for its money. Just to put things in perspective, the Electric Kangaroo has been described by our editorial team as "Like Mike Tyson in Both Strength and Looks”, and that’s not much of an overstatement. The One-Touch Ultra, on the other hand, with its industrial slat-rail style, doesn’t register any higher on the 'looker' scale. In the context of electric risers, the Winston-E comes as a welcomed relief to our eyes. Its polished black and grey design is versatile enough to fit any professional office space – from our more modest offices here in the labs, to that refined executive suite with the cherry desk. But we knew that the Winston-E was not just about looks, far from it. It’s advertised for innovative ergonomics and top-of-the-line stability as well. In terms of ergonomics, the first feature we evaluated was the Winston-E's patented design for monitor focal depth adjustment. In a breakthrough development for free-stand desktop risers, the Winston-E's monitor arms move forward and backwards. The monitors themselves also slide horizontally on the monitor arms, so we slid ours out a bit for extra space, and brought the two arms in until we found a comfortable viewing position. This sweet-spot is called the ‘design eye’ in ergonomics parlance, and we generally recommend about an arm’s length between you and your screen, depending on monitor size. Patented monitor focal depth adjustment. The focal depth feature is impressive. The increased flexibility made it easier to fine-tune viewing distance for our individual anthropometries, and helped prevent us leaning over the work space gradually as the day progressed, in the attempt to better see our screens. It will pay dividends for users in the long run, helping avoid unnecessary neck strain and lower back pain from craning over the top of the desk. Plus, the monitor arm movement facilitates screen-sharing with coworkers whenever they drop by your desk. To date, we’ve seen no other free standing desktop riser with an even remotely similar focal depth feature, (hence the patent). To get this type of adjustment otherwise, you’ll basically need to upgrade to a full scale standing desk with monitor arm(s). Monitors adjust vertically independent of the work surface. Before we move away from ergonomics, one more point of praise (and a small point of critique) for the Winston-E. The original Winston was a stable, spacious, non-electric desktop riser, but it didn’t have any easy way to adjust the monitor height independently from the work surface. 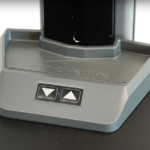 The folks at Innovative have responded and added a simple independent monitor height adjustment to the Winston-E. We can just turn a knob on the monitor post and each monitor arm is adjustable up and down along the height of the post. 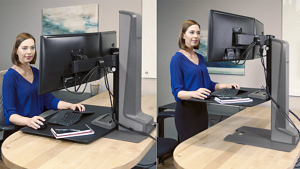 Many users find they need more space between their work surface and their monitors when they stand versus when they sit, so this feature allows for increased ergonomic fine-tuning. A possibility for improvement would be adding a way for the keyboard to rest at a declined angle, permitting proper wrist ergonomics. (Neutral arm and wrist position puts you in the posture of the ‘floating astronaut’, as we like to say.) We’ve only seen one free-standing riser to date with an adjustable tilt on the keyboard tray, and that’s a product from iMovR, called the ZipLift, but it's also available on hover-style units like the Helium Junior and the Cadence. But that piece of constructive criticism aside -- when you add together 18 inches of work surface height adjustment, independent vertical monitor adjustment, and monitor focal depth adjustment, we have to call the Winston-E one of the most ergonomically-friendly desktop risers we’ve seen to date. It’s so flexible that our 6’7” coworker was able to use the Winston-E like a charm, without reaching its maximum height levels. We’re happy to say our Winston-E demonstrated quite near rock-solid stability on the work surface. In this respect it carries forward one of the distinguishing qualities of its earlier version, the Winston. Even extended to the height needed for our 6’7” coworker, the surface was remarkably stable, keeping vibration to an absolute minimum, on par if not better than the stability of the original Winston. At first, you might think keyboard shake is not a big deal for your work productivity, but we’ve see our typing speed and accuracy decrease with shaking work surfaces in the past, so we’re especially wary. An unstable surface tends to vibrate the monitors so the images (or letters) on the page become tough to focus on. And when the keyboard moves, our grip on the keys is disrupted, and this forces us either to resituate, or to press down even harder on the work surface. It’s not only a distraction, it’s also poor ergonomics that can lead to wrist pain or carpal tunnel. Our Winston-E had no trouble handling the weight of our two 24” Dell monitors, and is rated to support up to 40 lbs. total. In case you have a smaller desk, Innovative offers a compact work surface, measuring 6” shorter than the standard, ideal for smaller 24” deep desks. With an even shorter work surface, the stability of the unit will only improve. The Winston-E comes in single, double, and triple monitor versions. The Winston-E raises desktop risers to new heights, and lands them in the executive suite. After completing our lab test, we can’t help but be impressed with Innovative’s unique ability to design such a high-functioning, aesthetically-pleasing sit-stand workstation. We don’t normally see many people willing to pay up for a desktop riser with an electric lift – after all, the cost puts them on par with standing desks (the very product they’re normally designed as a workaround for) – but the electric riser does reach a certain niche audience. And the Winston-E delivers for that target audience better than any other riser we’ve seen on the market. For those already invested heavily in office décor, say, with a premium cherry desk they don’t want to part with, the Winston-E gives you the very top-of-the-line to match your office aesthetic. 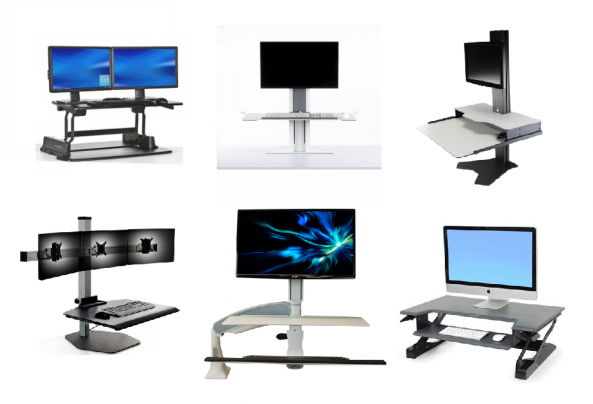 It's a sit-stand workstation that doesn't compromise on quality, style, or ergonomics, and we highly recommend it. Last year Innovative (the maker of the Winston & Winston-E) quietly acquired ErgoTech (the maker of a competing electric desktop riser, the OneTouch Ultra). ErgoTech’s product, with its quick-swap monitor setup, is targeted more towards mission critical applications like Wall Street and command centers (police, etc.). The Winston-E, with its ergonomics and superior aesthetics, more naturally fits in the executive office environment, where rooms are already heavily invested in décor.